It started with a love for the Hindi language. The melodic flow of words, the speech pattern, the way Hindi sounded like a language I have always known but couldn’t remember. I wanted to speak it more than anything. Second to that was culture. Beyond the colors, the language, the spirituality or values, was a place that seemed to beckon me. Little did I know, the one who sparked my love for India would become the one I now call my true love. About three years ago, I was working three jobs at a time. I lived on my own, supporting myself, in an ugly peach house in Blue Springs, Missouri. My full-time job was an overnight stocking job, my day job was part-time and I worked as a teacher, and finally, my weekend job was working as a barista at a coffee shop. It was lonely working nights, but I at least had the company of my online Indian friend, and we would talk at every opportunity. I was unhappy with my life, working so much and having no time for the things that were important to me, but at least I was making enough money to support myself, and enough to save for traveling. I was making plans to go to India. Unexpectedly, I lost my full-time job, and my other two jobs were not enough. I couldn’t support myself, even with my savings, and went into a financial crisis. India was far out of my reach and I felt hopeless. After that, friendships began to crumble and even relationships with my family were falling apart. I moved in with my best friend and her husband. Though I was happy to have her support, I was at an all-time low. One night, moments before falling into a deep sleep, I wondered where my life would take me. I closed my eyes, tears falling down, and not long after, Lord Ganesha appeared in my dreams. Without a single word, he spoke to me. His presence was warm and comforting, but in a way, he was pointing me in a particular direction. When I woke, something became very clear to me, but I couldn’t figure out the message I was supposed to understand. Three days later, I received news that I would be going to India and that someone would be sponsoring my trip. I worked until the day before I had to leave for India. My nerves were shot as I packed my suitcase and backpack. I questioned reality several times, because it just felt too good to be true. Reality didn’t fully sink in, until after I crossed the Atlantic Ocean. It didn’t sink in until I saw the sun rising over a dusty field in Hyderabad. This is where my adventure really began. 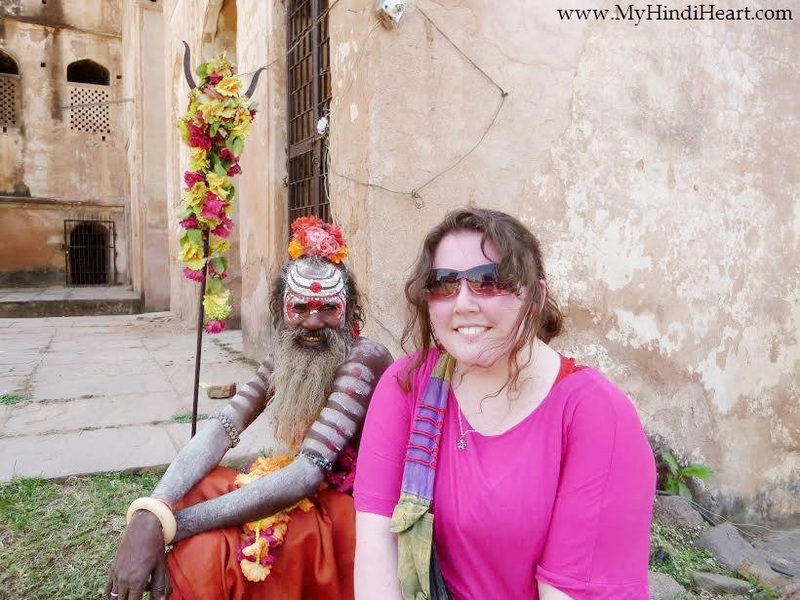 My travels took me from Hyderabad to Jhansi, where I met my online Indian friend, DN. Immediately, we both felt a spark between us. We felt as if we met a thousand times before. Despite what we felt, we remained as friends until the day I witnessed Lauren and her husband marry. Though at a distance, it inspired him, and we forged an unbreakable bond and made an oath to each other. I traveled back to Jhansi and then moved on to Delhi, to work with DN. Our relationship flourished, and despite the fact that we lived apart, we went everywhere together. I knew that our relationship would come with mutual sacrifice, and there was so much for me to learn. The youngest of his elder sisters lived in Delhi also. She and her husband approved of me and approved of us. They helped him break the news to his parents. His parents were shocked, and they did not approve. They had dreams of his future, and didn’t understand why he wanted to be with me. It was scary to them, that I was a foreigner, and they had several doubts and fears. They offered to find him a nice Indian bride, but DN stood his ground. He assured me that they would understand with time, that they would come to know I was nothing like the stereotypical westerner they feared me to be. I learned a hard lesson of how much I was judged in India, but it made me want to prove myself even more. I would meet them MORE than half way, by learning Hindi and carefully studying society and culture. I struggled with not being accepted by a culture I was in love with, but found balance between being myself and learning to be like an Indian. By the time I had to leave, I found it almost impossible to say goodbye to DN and impossible to leave India. Struggles aside, I found a place that truly felt fulfilling to me. It felt like home. I was ready and willing to do whatever it took to make things work between DN and I – but knowing our story would go on, did not make it any easier to leave. It all hit me at once. The realization that I accomplished my biggest dream, made many friends, had an amazing adventure and fell in love. India was everything it was meant to be, even the challenging parts. Currently, I am preparing to return to India in less than two weeks, and I couldn’t be more excited! Currently, DN’s parents seem to be more accepting of the idea that we are together, but I hope to strengthen our bond when I return to India. I’m ready to face every challenge. I’m ready to see me and DN’s relationship flourish. I’m ready to embrace India and free my soul once again. To think this all started with a love of the Hindi language, inspired by my first Indian friend many years ago… It’s been an incredible journey so far!